The last week working at Siemens was full of emotion and farewells. We have promised to return to China for a long visit in 2 years. Having focused on China, it's people, history, development, and business for so many years, it will be hard to leave. 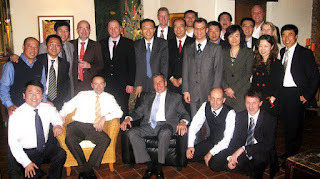 My boss organized a lovely farewell evening dinner party at the comfortable "Orchard Restaurant". About 30 people showed up from the Management Team. The usual speeches were given, but in my mind they seemed more personal and focused than many similar events. Pat joined and we all reminisced while also discussing the future. Soon it will be time for me to board an airplane to the USA. After 20 years living in Asia and working in China, it is with mixed feelings that I leave - although the plan to do so is entirely my own. To have been a witness of and contributor to the rejuvenation and growth of China during the last 20 years has been my privilege. To have worked with such an intelligent, hard working, and successful team as IA&DT China has been my honor. Wish you Happy Holidays and Success in the New Year!